Nine represents the number of games Dighton (7-2) has played this season. Nine is also the number of players the Hornets have on their entire roster. Dighton has three multi-year senior starters in twins Blair and Dalton Hoffman and wide receiver David Cramer. The trio saw time as sophomores when the Hornets, with 15 players, made a surprise run to the Eight-Man, Division II state championship game, the best finish in school history. Last year, Dighton also finished 7-2 with a nine-player roster, though took a pair of big losses in district play and missed the postseason. This season, Dighton again has just nine, including its entire offensive and defensive line that has never played high school football before. The Hornets are a significant Division II contender after an undefeated run through District 6. The Hoffmans, Cramer and junior Kaden Bradstreet are the only returning players from ’17. Dighton took competitive losses to Hodgeman County and St. Francis, both ranked in the top-4 in Division I, in Weeks 1 and 3, respectively. The Hornets have captured six straight victories, including a quality 48-12 playoff win versus Thunder Ridge last Thursday. This Friday, Dighton plays host to Northern Valley (7-2). The Hornets have outscored teams 400-150 against the classification’s No. 21 strength of schedule, according to Prep Power Index. Dighton ranks sixth in Division II in scoring defense and in the top-15 in scoring offense. Last year, the Hornets had a total margin of 326-148 versus the No. 22 SOS. The team has not had any full contact in practice since the second week. Dighton heavily focuses on fundamental work and technique. The Hoffman’s father, Dustin, serves as the assistant coach. . All nine players have not missed a single game. While some eight-man teams put in subs when they are close to the 45-point margin to ostensibly extend the game, Dighton looks to get to 45 and end the contest to keep players healthy. “You obviously get all the reps in practice, and the kids, they’ve bought in, and they are coachable, and been a good group,” Simon, 50-28 in his eighth year, said. 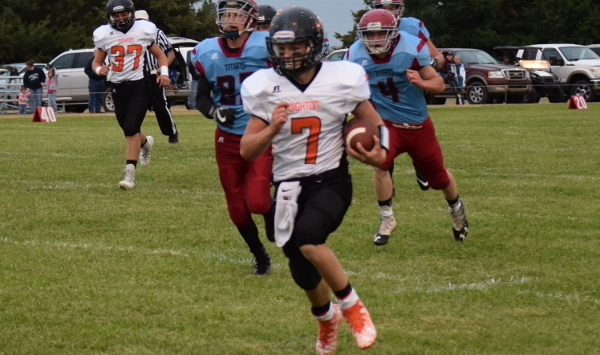 In Week 1, Dighton fell 38-12 to Hodgeman County, currently an 8-1 squad. Simon had “mixed emotions” with the season opener. Hodgeman County brought back its entire offensive line and hard-nosed junior all-state running back Eli Salmans from a Division II state championship game appearance last fall. Simon wanted to stay healthy and use the game as a new experience. “It was one of those deals where they learned awfully quick the physicality and just the overall effort that you have to put forth in a full game,” Simon said. After a 46-0 road win versus Oberlin, a Division I team that finished 4-5, Dighton led St. Francis, 12-6, in the second quarter on the road. St. Francis, currently 9-0, pulled away to win 54-20. Since then, Dighton is undefeated versus Division II squads with every win by at least 24 points and three shutouts. The Hornets join Osborne, Otis-Bison and South Barber as the leading western contenders. Dighton is 26-5 in the last three years. Blair Hoffman has delivered an exceptional season with 83 of 120 passing for 1,249 yards with a 31/2 TD/INT ratio. Dalton Hoffman has 87 carries for 658 yards and eight scores. Blair has delivered 121 carries for 619 yards and seven TDs. Cramer is one of eight-man’s top receivers with 42 catches for 749 yards and 17 TDs. The passing game has significantly improved from last fall. Last year, Blair completed 51 of 91 passing for 683 yards with a 9/6 TD/INT ratio. He rushed for 1,035 yards. Cramer and Dalton Hoffman each had 20 catches in 2017. Defensively, the trio combined for 222 tackles in ‘17. This season, they are at 283. Blair leads with 101 stops and 12 TFLs. Cramer has 98 tackles and four TFLs, and Dalton has recorded 84 tackles with seven TFLs. All three players have picked off at least three passes. Junior 6-foot-3 Marcus Rowe plays slot and receiver on offense and defensive back. He has delivered a solid year with 300 total yards and 53 tackles. Rowe was in Dighton and then moved to Colorado his freshman year and played eight-man football out west. Then, Rowe came back and did not play last year. Senior Donte Hudson has six TFLs, and juniors Bradstreet, a tight end/linebacker, and Tyler Walker, a lineman/defensive end each have 38 stops. Walker, the left guard/defensive end, is known for his high motor and effort. The 6-foot, 300-pound Hudson has started at center and nose guard. “He moves fairly well for a big kid,” Simon said of Hudson. Sophomore Ariel Arevalo, the starting right guard and defensive end, has 37 tackles. Arevalo is 5-11, 255 and manages the ‘B’ gap effectively. Freshman Jaden Coleman, who weighs 115 pounds, has generally served as the reserve and mainly plays on special teams. He started a district game versus Tribune-Greeley County in Week 4. “These guys, they have never played high school football, but they have definitely developed a ton throughout the season,” Simon said. In last week’s 48-36 victory over Chanute, Tonganoxie’s Korbin Riedel carried 47 times for 352 yards and three touchdowns. Riedel’s heavy work load helped the Chieftains put up more than 600 yards against the Blue Comets and got us wondering who have had the heaviest work loads this season among backs. According to MaxPreps stats, Riedel leads the state with 251 carries. That’s impressive considering the Tonganoxie senior is listed at 5-foot-6 and 145 pounds. What’s more impressive is Riedel didn’t start the season taking the majority of the Chieftains’ carries. In fact, he carried only 10 total times in the Chieftains’ first two weeks for 91 yards. Notably, those are the only two games Tonganoxie has lost this season. Since those losses to Basehor-Linwood and Louisburg, Tonganoxie is 7-0 and Riedel has averaged 34 carries per game for an average of 186 yards. Minneola’s Jeremy Pfaff is second in the state with 239 carries this season. Pfaff rushed for 1,915 yards for the Wildcats, who finished 4-5 and missed out on the Eight-Man, Division II playoffs. Pfaff had consecutive monster games in district play that helped boost his numbers. In a wild 92-80 victory over Ingalls, Pfaff (5-11, 170) rushed 55 times for 502 yards and nine touchdowns. One week later, Pfaff carried 46 more times for 332 yards and four scores in a 48-42 loss to Bucklin. In that two-week span, Pfaff carried 101 times for 834 yards and 13 touchdowns. Wichita North’s Joe Williams had a breakout junior year for Scott Moshier’s ground-oriented offense. Williams (5-9, 150) rushed for 1,469 yards and nine scores on 224 carries. For the season, Williams averaged 24 rushing attempts per game with a high of 32 in a 27-12 loss to Wichita East in which Joe produced 145 yards. Other notable one-game performances include Hodgeman County’s Eli Salmans’ 45-carry, 268-yard and three-touchdown effort in the Longhorns’ surprising 28-26 loss to Ness City to end the regular season. And, of course, there was St. Thomas Aquinas sophomore Tyron “Tank” Young’s 44-carry, 312-yard performance against Bishop Miege a few weeks ago. Young, one of the state’s breakout stars, has 151 carries on the season for 1,459 yards and 19 scores. After an open week to close out the regular season, Young did not play in the Saint’s opening-round 69-14 victory over Topeka Highland Park. Victoria (7-2) travels to No. 3 St. Francis (9-0) this week. Since it moved to the eight-man ranks before the 2014 season, St. Francis is 3-0 in home playoff games and 1-3 in road/neutral postseason contests. Since 2009, St. Francis is 4-0 in home playoff games and 1-4 in road/neutral. The last time the Indians lost a home playoff game was a 38-30 second-round defeat against La Crosse in 2008. Tim Lambert, in his last game at St. Francis, coached the Indians. Ryan Cornelsen won his final game at La Crosse. The two are currently at Smoky Valley and Gardner-Edgerton, respectively, and have 9-0 teams this year. Victoria has captured 11 straight home games overall and has not lost a home playoff game since 2011. However, the Knights are 5-4 in road/neutral playoff games since 2010. The last three road losses, including to Burlingame last season, have been by three, six and 10 points. Hoxie travels to No. 2 Clifton-Clyde (9-0) in one of the more highly anticipated matchups. Hoxie is the defending Eight-Man, Division I state champions. A trademark for the Indians is great defense. Last fall, Hoxie was second in eight-man football with just nine points a game. The 8-1 Indians returned its outstanding senior line of Taye Washington, Colton Heskett and Jarrod Dible. Hoxie has upped its scoring from 44.8 points per game last year to 49.1 this fall. However, Hoxie has permitted 21.3 points a contest, on pace for Hoxie’s highest scoring defense average since 2010. The strength of schedule is virtually the same in the last two years. A lot of the defensive numbers are similar to last season. In 2017, Hoxie forced 2.85 turnovers a contest and averaged 8.5 tackles for loss a game. Hoxie was plus-1.38 in turnover margin per game in ’17. This year, Hoxie has forced 2.8 turnovers per game and averaged 7.3 TFLs per contest. Hoxie is plus-1.7 in turnover margin per game. Even the kickoffs are similar. Washington averaged two touchbacks a game last year and 1.8 this fall. However, a huge difference comes in punting, normally not a significant part of the eight-man game. The Indians graduated both punters, all-stater Troyal Burris (24 punts) and Luke Schippers (seven punts). Hoxie averaged 36.6 per punt and put 17 of 31 inside the opponents’ 20-yard line. This year, Jared Kennedy, the multi-year starting quarterback, has eight punts for 17.6 yards per punt and two inside the opponents’ 20-yard line. Hoxie’s punting could prove a key part of Friday’s contest. So will turnovers. Whilte Hoxie has forced nearly three turnovers per game this season, Clifton-Clyde has yet to commit a turnover this season. Ness City (7-2) plays at No. 1 Central Plains (9-0) on Friday. Both Central Prairie League’s Ness City and Central Plains have captured undefeated Division I state titles in the last six years. Ness City won ’12 and Central Plains in ’14. In the season opener this season, Central Plains scored twice late in the fourth quarter to beat the Eagles 30-14. Since Central Plains formed in 2011 with the consolidation of Claflin/Quivira Heights, the Oilers are 4-0 against Ness City. The teams did not play in ’12. In ’14, Central Plains defeated Ness City, 32-0, in the sub-state title game and earned regular season wins, 54-8 and 44-20 the last two seasons. Last week, Ness City defeated Macksville, 44-20. Coach Marc Cowles, a head coach for 17 seasons, has a career mark of 85-74. Before he took over at Ness City four years ago, Cowles coached Weskan for 13 years. The Week 9 win marked his first playoff victory since a 52-6 win versus Northern Valley in 2005. Otis-Bison has permitted 64 total points in eight of its contests. In Week 6, though, Otis-Bison tied No. 4 South Barber 36-36 in a game called at halftime because of weather. The Cougars struggled versus SB’s passing offense led by junior quarterback Trevor Rooks and smaller, quick skill players paced by 6-foot senior Neal Gugelmeyer and 5-7 sophomore Emilio Perez. Rooks passed for 218 yards. This week, Otis-Bison gets a similar matchup with Hutchinson Central Christian’s Caleb Lambert. He has completed 65 percent of his passes for 1,792 yards with a 29/6 TD/INT ratio. Central Christian, led by Adam Hall and Marshall Walton, have 589 and 583 receiving yards, respectively. Hall is 6-foot, and Walton stands at 5-8. Otis-Bison senior Maitland Wiltse, at 6-4, will likely guard Hall/Walton. Against South Barber, Wiltse was beaten early for big plays but finished with an interception and fumble recovery. Big plays in the passing game – either on offense or defense - will likely play a huge role in the contest. As well, Otis-Bison has five special teams scores, four on kickoff by senior Anton Foust and one from Wiltse on a punt return. Central Christian made a big comeback in a 70-68 three-overtime loss to South Barber partially because of onside kicks. Another key matchup could be Central Christian’s kickoff coverages versus Otis-Bison. Ben Labertew was an all-state quarterback at Sylvan Grove. He in his 18th year overall, including seven at Sylvan-Lucas after 11 seasons with Natoma. Labertew carries a career record of 70-69, including 6-3 this fall. Sylvan-Lucas is at No.3 Osborne (8-1) this week. Last Thursday, Sylvan-Lucas went 201 miles west to Wallace County and defeated the Wildcats and coach Kevin Ayers, 44-0. It marked the first playoff victory of Labertew’s career. Last season, Sylvan-Lucas went 8-2 but lost at Otis-Bison in the first round of the playoffs. It marks the first playoff win for Sylvan since 2006 when the Mustangs finished 11-1 with longtime coach Mike Weatherman. At Natoma, Labertew led the Tigers to the 2007 playoffs, still the last time Natoma has made the postseason – and just the third occasion in school history. Natoma finished as state runner-up in ’74 and qualified in ’86. In ’07, Natoma lost to Wallace County, 56-8. Wallace County won the state title that year with Ayers as head coach. Wichita Homeschool (8-0) plays host to Cair Paravel in the KCAA playoffs this week. Homeschool defeated Cair Paravel, 59-8, in Week 3. Homeschool had seven players earn selection to the NAAPS – National Athletic Association of Private Schools - All-Star Game held Jan. 5 in Gatlinburg, Tenn. NAAPS has the Warriors ranked eighth nationally in the Division 5 (eight-man football) rankings. The seven players are senior running back/safety Marshal Masterson and six juniors: lineman/linebacker Josh Martin, receiver/nose guard Cam Day, offensive guard Brandon Eck, receiver/defensive end Jonah Wolters, quarterback/defensive end Will Day and running back/linebacker Luke Johnson. On Thursday, Day was named as a NAAPS National Player of the Year D5 Finalist, along with Maranatha Christian Academy receiver Brock West. Day has completed 60 percent of his passes for 1,784 yards with a 29/5 TD/INT ratio and rushed 32 times for 346 yards and 10 scores. West helped Maranatha finish 6-3 in Eight-Man, Division I. He hauled in 60 catches for 1,204 yards and 29 scores. Overall, six D5 players were nominated, four quarterbacks, a running back and West as the wideout. The other selections came from South Carolina, Kentucky, Louisiana and Alabama.